The temperature cooled down a bit to a comfortable 70 degrees. 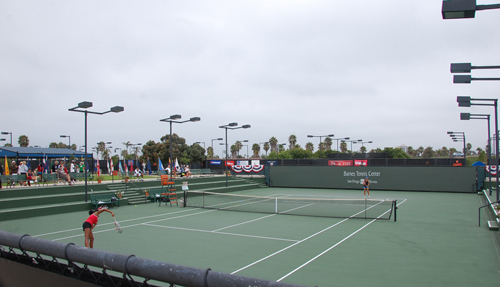 The spectators needed jackets and pants to get through the day, but the play was heating up on the courts of the Barnes Tennis Center in San Diego for the USTA Girls' 16 & 18 Nationals Championships. This was especially true in the 16s, where more than half went the distance. 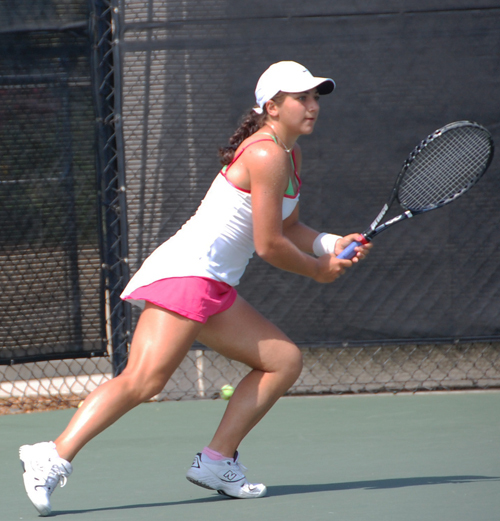 The struggles were at the top with even top-seeded Kimberly Yee pushed in a marathon filled with long games against Louisa Chirico (17-32) (below). I would come and go to court 6 for hours before Kimberly finally prevailed at 6-7(3),6-2,6-3. 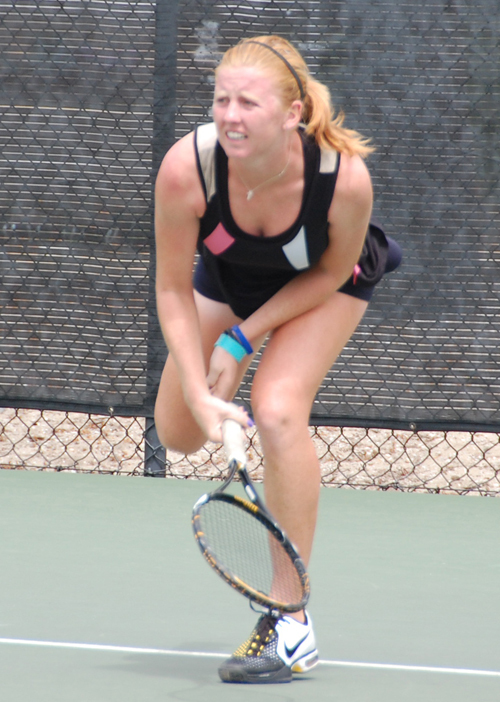 It was a similar challenge for fourth-seeded Spencer Liang, when Kimmy Guerin (17-32) stretched it to 4-6,7-5,6-3. Two top seeds were not so lucky. 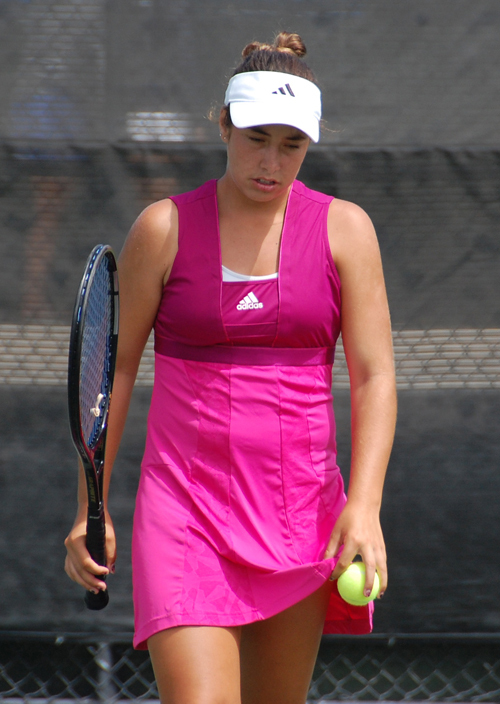 Seventh-seeded Sivan Krema fell to unseeded Cassandra Vazquez at 3-6,6-3,6-4, and sixth-seeded Alanna Wolff lost her bid for the round of 16, when alpha seed Amy Zhu took the match at 3-6,7-6(5),6-2. Two more unseeded players in the 16s, Mary Closs, who had beaten 17-32 Manon Peri yesterday, and Emma Alderman, a winner over No. 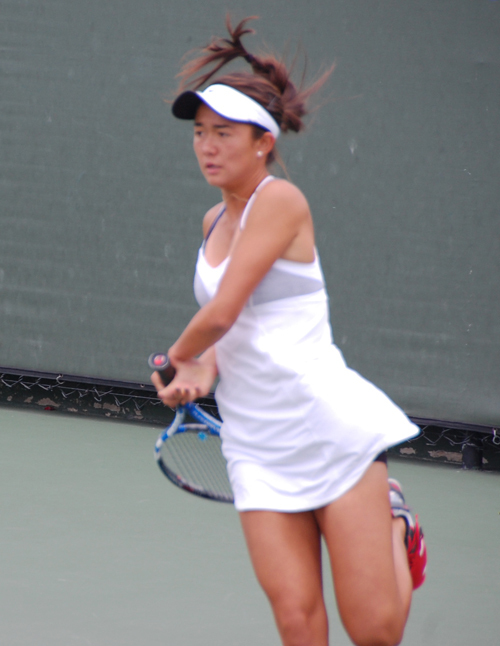 10 Yuki Chiang in the first round, a winner over Laura Patterson (17-32), also advanced. Katrine Steffensen, seeded two in singles, had no problem getting by in her individual match, but she and partner Shannon Hudson didn't live up to their No. 1 seeding in doubles, dropping the match to No. 9 Yuki Chiang and Alexis Pereira, 6-0,6-2. The duo will face Sivan Krems and Manon Peri (6) in the quarterfinals. In the other matches, third seeded Dasha Ivanova and Mia King will play Blair Martin and Peggy Porter (7); Hadley Berg and Closs face Lauren Marker and Alyssa Smith; and Josie Kuhlman and Lauren Patterson (9) meet Marianna Gould and Spencer Liang (2). The 16s battled on the court all morning, but most of the 18s seeds breezed through their afternoon matches. I watched some of a very solid sixth-seeded Grace Min, who finished her shutout match in less than 40 minutes. I also say Brooke Austin and Julia Elbaba, both unseeded here, battle in a rematch of the 2009 Easter Bowl final. The match was even closer than the 6-3,6-4 score indicates. The minor upsets belonged to Courtney Colton with a 6-3,6-1 win over Stephanie Vlad (17-32), and Hannah King, with a 6-2,6-3 defeat of Ashley Dai (17-32). It took a crowd of hometown fans to get Christina Makarova back on track after she slipped from 5-1 to a tiebreaker in the first set with Taylor Davidson. She stepped it up in the breaker, though, losing only two points and then just one game in the second set. 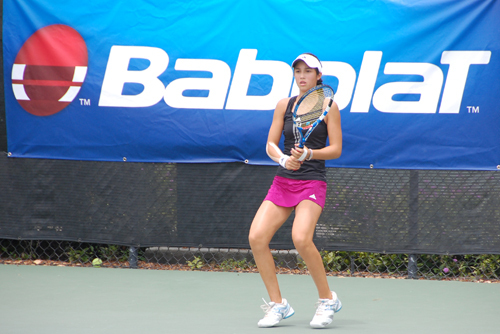 The Babolat Player of the Day for Tuesday is Tina Jiang of Bridgewater, New Jersey. 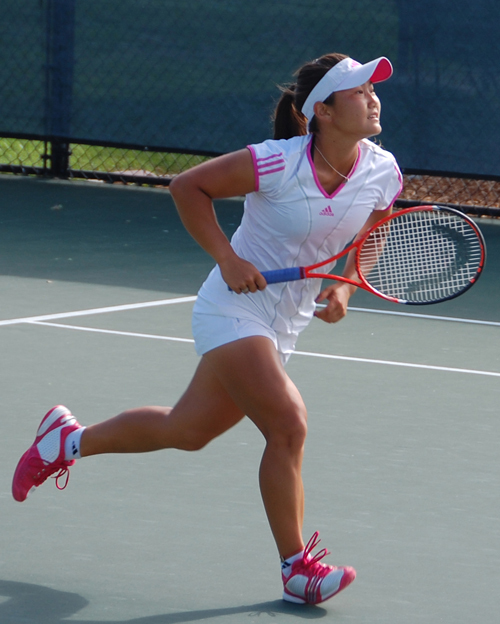 Jiang held off second-seeded Krista Hardebeck for over three hours before succumbing 4-6,6-2,7-5. 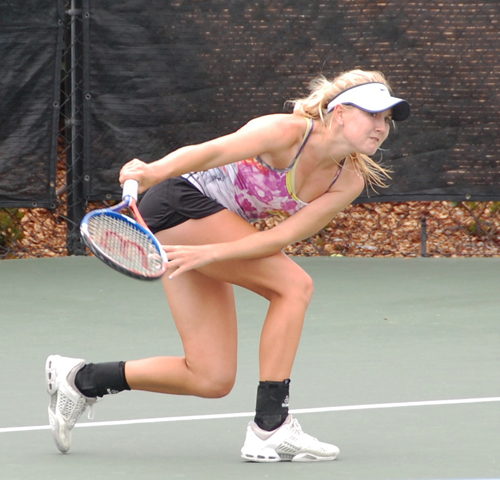 The Girls' 18s did not play doubles on Tuesday. I am still (happily) amazed that I can cover at a tournament that never has rain delays and finishing promptly at 7:30 each night! I was able to even sit down and have a veggie burger in the Hilton San Diego Mission Valley restaurant last night (without my computer in front of me). Wednesday is looking pretty good too, with all main draw mathes at the Barnes Tennis Center.